Just In Time For Father's Day-20% Off Friends & Family Sale At Kohl's! 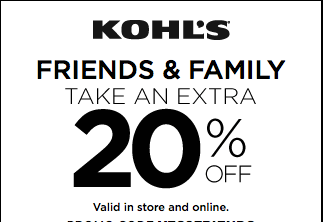 You are here: Home / Great Deals / Just In Time For Father’s Day-20% Off Friends & Family Sale At Kohl’s! Just In Time For Father’s Day-20% Off Friends & Family Sale At Kohl’s! Get an extra 20% off at Kohl’s through Sunday, June 7 with in-store pass or online promo code! Get FREE standard shipping with $75 purchase or Buy Online and Pick Up in store! Print your in-store pass or use code YES2Friends online to receive your extra 20% off!